Daniel J. Murphy - dmurphy@shawmedia.com Jeff Skiles speaks to a small crowd at a free event Saturday March 10, 2012 at Galt Airport in Wonder Lake, IL. Jeff Skiles was the captain on US Airways flight 1549 when it landed on the Hudson River back in 2009. Skiles is now EAA's new Vice President of Chapters and Youth Education. 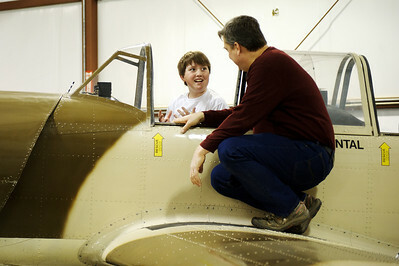 Daniel J. Murphy - dmurphy@shawmedia.com Neil Anderson of Spring Grove lets Kyle Zetterland, 13, of Cary explore his Yak 52 experimental aircraft at a free event Saturday March 10, 2012 at Galt Airport in Wonder Lake, IL. 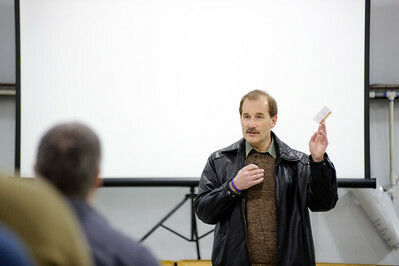 Jeff Skiles speaks to a small crowd at a free event Saturday March 10, 2012 at Galt Airport in Wonder Lake, IL. Jeff Skiles was the captain on US Airways flight 1549 when it landed on the Hudson River back in 2009. Skiles is now EAA's new Vice President of Chapters and Youth Education.